Brest is a city in the Finistère department in Brittany in northwestern France. Located in a sheltered position not far from the western tip of the Breton peninsula, and the western extremity of metropolitan France, Brest is an important harbour and the second French military port after Toulon. The city is located at one of the occidental edges of continental Europe, hence the expression « Europe from Brest to Brest ». Counting 142,722 inhabitants, Brestois and Brestoises , Brest is the main metropolitan area of Western Brittany, only third behind Nantes and Rennes in the whole Brittany, and the 22nd populous city of France; moreover, Brest provides services to the one million inhabitants of Western Brittany . Although Brest is by far the largest city in Finistère, the préfecture of the department, Quimper, is much smaller. During the Middle Ages, the history of Brest was the history of its castle. Then Richelieu made it a military harbour. Brest grew around its arsenal, until the second part of the 20th century. Profoundly marked by the Allies bombing raids during World War II, the city centre was completely rebuilt after the war. At the end of the 20th century and the beginning of the 21st century, the deindustrialization of the city was followed by the development of the service sector. Nowadays, Brest is an important university town with 23,000 students. Besides a multidisciplinary university, the University of Western Brittany, Brest and its surrounding area possess several prestigious French elite schools such as École Navale , Télécom Bretagne and the Superior National School of Advanced Techniques of Brittany . Brest is also an important research centre, mainly focused on the sea, with among others the largest Ifremer centre, le Cedre and the French Polar Institute. Brest’s history has always been linked to the sea: the Académie de Marine was founded in 1752 in this city as well as the aircraft carrier Charles-de-Gaulle was built there. Every four years, Brest hosts the international festival of the sea, boats and sailors: it is a meeting of old riggings from around the world. Nothing definite is known of Brest before about 1240 , when a count of Léon ceded it to John I, the Duke of Brittany. 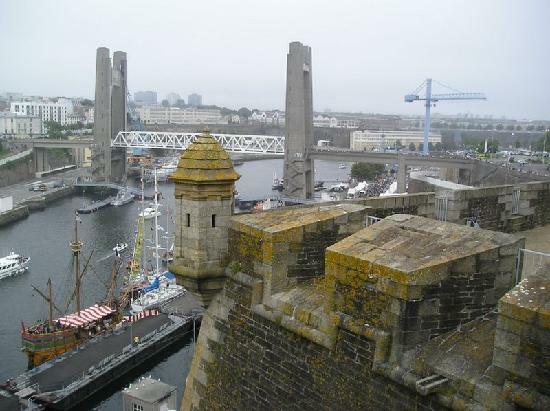 In 1342, John de Montfort surrendered Brest to the English, in whose possession it was to remain until 1397. The importance of Brest in medieval times was great enough to give rise to the saying, "He is not the Duke of Brittany who is not the Lord of Brest". With the marriage of Francis I to Claude, the daughter of Anne of Brittany, the definitive overlordship of Brest – together with the rest of the duchy – passed to the French crown. The advantages of Brest's situation as a seaport town were first recognized by Cardinal Richelieu, who in 1631 constructed a harbor with wooden wharves. This soon became a base for the French Navy. Jean-Baptiste Colbert - the finance minister under Louis XIV - rebuilt the wharves in masonry and otherwise improved the base. Fortifications by Vauban (1633–1707) followed in 1680-1688. These fortifications, and with them the naval importance of the town, were to continue to develop throughout the 18th century. In 1694, an English squadron under John Berkeley, 3rd Baron Berkeley of Stratton, was soundly defeated in its attack on Brest. During World War I Brest France was used as the disembarking port for many of the USA troops coming from America in 1917. Thousands of United States troops came through this port on their way to the front lines. In World War II, the Germans maintained a large U-boat base at Brest. The city was totally destroyed during the Battle for Brest in 1944 after the Allied invasion of Normandy, with barely more than three buildings left standing. After the war, the West German government paid several billion deutschemarks in reparations to the homeless and destitute civilians of Brest in compensation for the destruction of their home city during the course of the war. Large parts of today's rebuilt city consist of utilitarian granite and concrete buildings. The French naval base now houses the Brest Naval Training Centre. In 1972, the French Navy opened its nuclear weapon-submarine base at Île Longue in the Rade de Brest . This continues to be an important base for the French nuclear-armed ballistic missile submarines. Whole or part of the information contained in this card come from the Wikipedia article "Брест (Франция)", licensed under CC-BY-SA full list of contributors here.